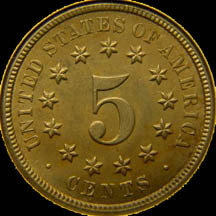 Shield nickel variety collectors are a fortunate lot - the coinage series offers far more varieties and far more interesting varieties than almost any other U.S. series. The fantastic doubled die shield nickel pictured above is but one small sample of the varieties available. Shield nickel variety collectors are also an accursed lot - the sheer number of varieties and the great similarity of some of the varieties to each other can make accurate attribution of shield nickel varieties an exercise in frustration. 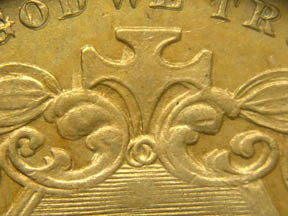 Currently available reference books about shield nickels provide a small picture of the variety area of the coin only, so the die crack on another part of the coin that would conclusively establish the attribution for you is frustratingly not visible. Shield Nickel Viewer (SNV) is a computerized reference for shield nickels, designed to facilitate accurate attribution of shield nickel varieties. 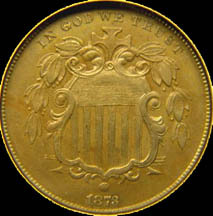 Multiple pictures of all areas of the coin are provided so that any possible hints for correct attribution are visible. A computerized reference offers many advantages over printed references - the "Welcome" page of the SNV manual explains these advantages. System requirements for SNV are not absolutely fixed, but the author recommends 256K of memory and a processor comparable to a Pentium 500mhz. Thus, any computer of reasonably recent vintage should suffice. If the trial version runs successfully you should have no problems with the full version. Please follow the "Trial Version" link below to learn about installing a Java Runtime Environment (JRE). If you are unsure as to whether your computer can successfully run SNV, you are welcome to download the trial version and test it. SNV is guaranteed to be 100% virus and spyware free. You are cordially invited to follow the links below to learn more about SNV. If you would like to get an idea of what photos SNV provides but don't want to download the entire trial version, please go to this page. Please contact the Author for information about licensing SNV. This page copyright (C) 2004, 2005, 2012, 2014 by Howard Spindel. All rights reserved.